The tell-tale signs of spring never cease to amaze me. Sitting in front of my window the other morning, I finally heard the hopeful song of spring’s advent floating through the air. Exactly what was there to hear, you ask? The birds, singing their beautiful, light-hearted melodies. The lovely creatures had returned from their winter exodus, meaning that spring would soon arrive. As the sun began to rise, lighting the landscape outside, a small bright red dot came into focus, its weightless body flitting playfully about the ground, not a care in the world to weigh it down. I’ll never forget the mornings in the spring and summer months when my dad would discover a cardinal outside our family’s kitchen nook windows. I never quite appreciated the presence of such a bird, but I found my dad's fascination with the creature interesting. What delighted him so much that he would consistently point out the presence of this fire-breasted bird to his watching daughters? Now I see. 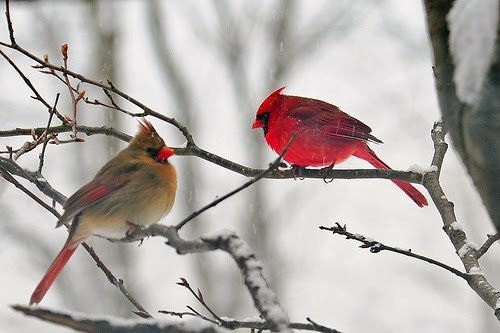 A cardinal’s physical make-up and unique coloring only add to the beauty of what the cardinal represents—a new season, a return to life and, as we’ll see now in Scripture, an illustration for a Christ-centered and peaceful heart, one fully resting in the Kingdom of God and His righteousness as its singular, holy pursuit. A person trusting in the Lord, aware that this life is temporary, not worried, doubtful or anxious about one single thing. Wouldn’t that be marvelous? I wonder what it might be like to have no worries or cares, to be like a fire-breasted cardinal, flitting about the soft grass that glistens from the touch of morning dew. Communicating with my fellow birds in melodies sweet to the ear of the outsider. A life with no to-do lists, expectations, responsibilities or worries. Or at least the capacity to say, "Off with you, worries! I choose peace." Yet, that we can do. Our lives are far richer, far more valuable than those of birds! We are told this in the Gospel of Matthew by Jesus, Himself. Still, because of sin’s presence and the Kingdom of God yet to come, we suffer from so many anxieties that rob us of our salvation-joy—and they are problems so much so that Christ must address their presence in our lives. I do want to qualify my thoughts before proceeding: what I touch on in the remainder of this post is not necessarily a commentary on heightened experiences of anxiety, panic attacks or depression. Although I do believe that the gospel speaks even into these real-life scenarios, my hope is to address the root of our heart-battles with restlessness, discontentment and worry. ONE: Laying up earthly treasures. 19 “Do not lay up for yourselves treasures on earth, where moth and rust destroy and where thieves break in and steal, 20 but lay up for yourselves treasures in heaven, where neither moth nor rust destroys and where thieves do not break in and steal. 21 For where your treasure is, there your heart will be also. The first way to become anxious, Jesus tells his disciples, is to put your trust and faith in temporal objects and pursuits. Earthly treasures can come in many forms: achievement, recognition, approval, wealth, appearance, relationships, talents, and vocations – to name several off a never-ending list. Jesus reminds us that our attempts to find satisfaction and security in earthly treasures will ironically yield fruit opposite of anxiety. Why? Because “moth and rust destroy” them, and “thieves break in and steal” them. They will not last forever. The last time I put my trust in an earthly treasure, it was a job situation, and the result was discontentment, worry and doubt. Why was I clawing at anything and everything at my job to make me feel safe and secure, when tomorrow it could be gone? Trusting in Christ for our righteousness and our daily needs, we “lay up for [ourselves] treasures in heaven”, realizing that only the pursuit of Christ will give full return of joy for our souls. TWO: Making a practice of sin. 22 “The eye is the lamp of the body. So, if your eye is healthy, your whole body will be full of light, 23 but if your eye is bad, your whole body will be full of darkness. If then the light in you is darkness, how great is the darkness! Next, Jesus tells us that remaining in practices of sin will yield darkness – and that darkness exposes itself through anxiety, discontentment and dissatisfaction. A Christian will especially feel the weight of this, as sin runs contrary to his or her new nature in Christ Jesus as a regenerated creation. The unbeliever will continue to rebel against God's will and person, only causing them increased guilt and discontentment. Because we were not created to rebel against God – we were created to commune with Him and worship Him – anything that opposes the Lord’s will creates strain and disharmony in our union with Him. The result of sin is discontentment and shame within our souls. Reconciliation to the Father is the only way out of this strain, but we cannot find our way out alone. It is not possible to live a spotless life on our own efforts and good works. But Christ lived the perfect, sinless life for this purpose: that all those who trust in Him as Savior and Lord would be given His clean record, now unto eternity, to the glory of God the Father. In Christ, we have defeated sin and death’s power; and so, we no longer live according to the flesh, but according to the Holy Spirit dwelling within us. THREE: A divided heart. 24 “No one can serve two masters, for either he will hate the one and love the other, or he will be devoted to the one and despise the other. You cannot serve God and money. Finally, Jesus tells us that a heart divided between two pursuits will produce anxiety. He talks specifically about money, but a divided heart can also come in other forms. I struggle at times with Christ being all-sufficient for me, especially when I find myself fearing man over fearing the Lord. In that case, my heart is divided. Its sole pursuit is not Christ – it is man’s opinion of me. Because my gaze is not firmly fixed on Jesus, I start to flail and sink (like Peter in the waves)! And what about our battles with doubt? Our hearts are divided when we doubts God’s goodness, His care or His promises. A divided heart produces only worry and fear within us. But a heart set singularly upon pleasing the Lord God and knowing Christ Jesus intimately is a heart undivided in worship and reverence and awe. This is a person aligned with the heart of God that prays, "Unite my heart to fear Your Name!" Be encouraged, sisters, that Christ calls out these sources of worry because He knows the solution – it is found in Himself! Only the good news that Jesus came to seek and save the lost gives us any hope of battling our worries and discontentment. We wage war against anxiety by resting in His promise to never leave or forsake us. We spend time knowing Christ by His Word and prayer, walking in grateful obedience to His will. Only then, in fellowship with Jesus and by His Spirit’s power, will we overcome the love of earthly treasures, the practice of sin, and the heart-struggles that would otherwise threaten to divide our devotion to Christ. Rest assured, our God is faithful, and He will certainly do it! Lord God Almighty, We need Your help to battle anxiety in a world that so quickly promotes and encourages it within us. We choose to trust You, worship You and confess our sin to You. Our hearts are divided at times; we do sin; and we confess our desires for earthly treasures. But nothing compares to knowing Christ and seeking Him! Unite our hearts to fear Your Name. By Your power, defeat anxiety and worry within us. Thank You for Jesus, for the cross and for hope eternal.